SAN DIEGO--(BUSINESS WIRE)--Hail the blackberry! Ballyhooed by various cultures for centuries as a miracle fruit, the blackberry is now set to cure the shake cravings of Jack in the Box® guests. For a limited time beginning today, Jack in the Box restaurants are adding Blackberry to their line of real ice cream shakes. 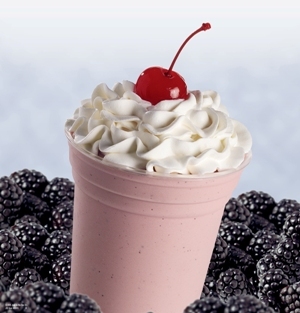 Available in 16- and 24-ounce sizes, the new Blackberry Shake is made with real ice cream and blackberry-flavored syrup and features whipped topping and a Maraschino cherry on top. Jack in the Box Inc. (NASDAQ: JACK), based in San Diego, is a restaurant company that operates and franchises Jack in the Box® restaurants, one of the nation’s largest hamburger chains, with more than 2,200 restaurants in 19 states. Additionally, through a wholly owned subsidiary, the company operates and franchises Qdoba Mexican Grill®, a leader in fast-casual dining, with more than 500 restaurants in 43 states and the District of Columbia. For more information, visit http://www.jackinthebox.com/. Dubba's note: So it's limited and it's new, but it's been around before? Oh I'd complain about the doublespeak, but honestly, this sounds good and I wish I could try it! Man, I miss that shake. I visited SD from Toronto, Canada and loved the Blackberry one.